Prism provides benchmarking and efficiency studies using frontier analysis, also known as data envelopment analysis. We use the industry standard software, Frontier Analyst™. It calculates the relative efficiency of “units” within a set based on multiple input-output ratios. Units can be schools, retail locations, hospitals, etc. 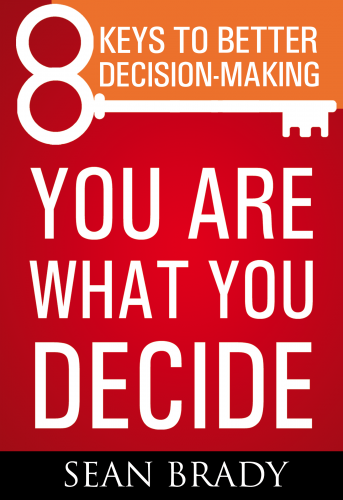 Inputs are resources used, and outputs are results achieved. Convert a unit’s inputs and outputs into a single measure of productive efficiency. Identify units operating relatively efficiently and those that are not. Calculate efficiency scores for all units in the study: units making most efficient use of resources are rated as being 100% efficient, benchmark units while the less efficient ones obtain lower scores. Set realistic, peer-based improvement targets for lower performing units by comparing them to their unique set of 100% efficient, benchmark peers. These targets show how much each unit needs to increase outputs or reduce inputs to become a 100% efficient, benchmark peer. How well their units are doing. Where they can go to find out how. Assume for the purposes of illustration that a retail chain was studying performance of its outlets by measuring one input, the number of employees, and two outputs, the annual number of customer transactions and annual gross revenue. Two performance ratios result: transactions per employee and gross revenue per employee. The performance of the retail chain’s outlets could be shown in a scatter diagram, as below. 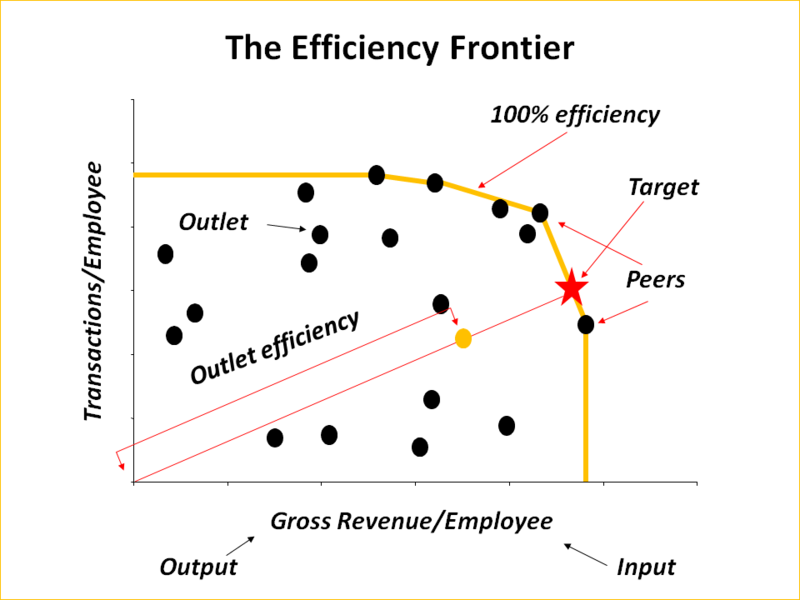 The efficiency frontier ‘envelops’ the inefficient units and clearly shows the relative performance of each unit. Any unit on the frontier is considered 100% efficient and any unit below it is relatively less efficient with a rating of less than 100%. In this example, there are four 100% efficient, benchmark outlets. And the outlet represented by the green dot is 75% efficient. Note that the efficiency frontier, derived from the most efficient units in the data set, represents a standard of best-achieved performance. This does not imply that the units on the frontier cannot improve their performance. There is simply no demonstrable basis to measure the extent to which they can do so. Note also that an actual analysis weights each unit’s inputs and outputs in order to show it in its best possible light. Each unit in the set is matched with a set of benchmark peers. These are the 100% efficient units that have the most similar input-output profiles to any selected unit. In the example above, the outlet represented by the green dot has two benchmark peers. Increase its annual gross revenue or transactions (outputs) to push its ratios to the frontier. Lower the number of employees (input) to push its ratios to the frontier. The example above is simple and therefore its results can be displayed in a two-dimensional scatter diagram for graphic illustration. Actual studies, however, include many inputs and outputs and produce results that are n-dimensional and virtually impossible to visualize. To view real results of a comprehensive frontier analysis study and examples of the software’s powerful use of graphic display to communicate those results, please see the discussion of Prism’s large scale Frontier Analyst studies in New York or Arizona. Want to know how well your organizational units perform? Not just on one performance factor or ratio, but comprehensively? And more importantly, how much they could improve? Identifies star performers and benchmark units as well as under-achievers. Sets realistic, peer-based improvement targets. Uncovers greatest potential efficiency gains. Provides a framework for systematic transfer of best practices. Prism’s top-flight team includes Chief Technology Officer, Andrew Tait, Decision Mechanics Limited, the author of Frontier Analyst™, the industry-leading performance management system used in more than 30 countries worldwide.